Preheat your skillet over medium low heat with a splash of vegetable oil. In a large bowl sift together flour, baking powder, salt and sugar. In a separate bowl beat the eggs and then add melted butter, whole milk, vanilla extract and nutmeg. Ensure the melted butter is not too hot otherwise it might cook your eggs! Pour the wet ingredients into the dry and stir until just incorporated. If it looks chunky do not despair – leave the mixture sitting for a couple minutes and the flour will absorb all of the wet ingredients and will stiffen. If the batter is too thick to work with add a tiny bit of milk. Stir in the shredded coconut and scoop ¼ cup of batter into your pre-heated pan for each pancake. Add a splash of vegetable oil to your pan between batches. Your pancakes are ready to flip when bubbles break on the surface and the bottoms are golden brown. In a medium sized fry pan melt the butter and sugar for the bananas foster over low heat. Once melted and combined add the sliced bananas and nutmeg and stir until coated. 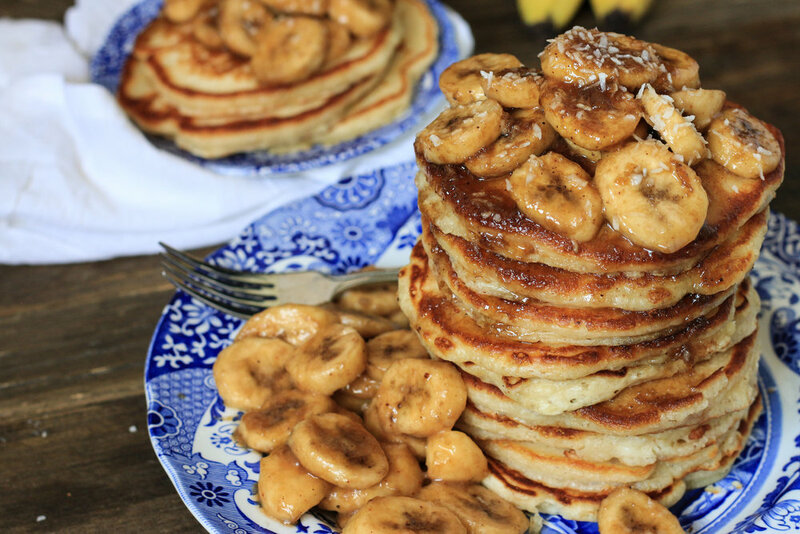 Remove the bananas from the pan and set aside. Increase the heat to medium, bringing the sauce to a simmer and then carefully add the rum. This should create a flame that you want to burn until it dies (approximately 1 to 2 minutes). 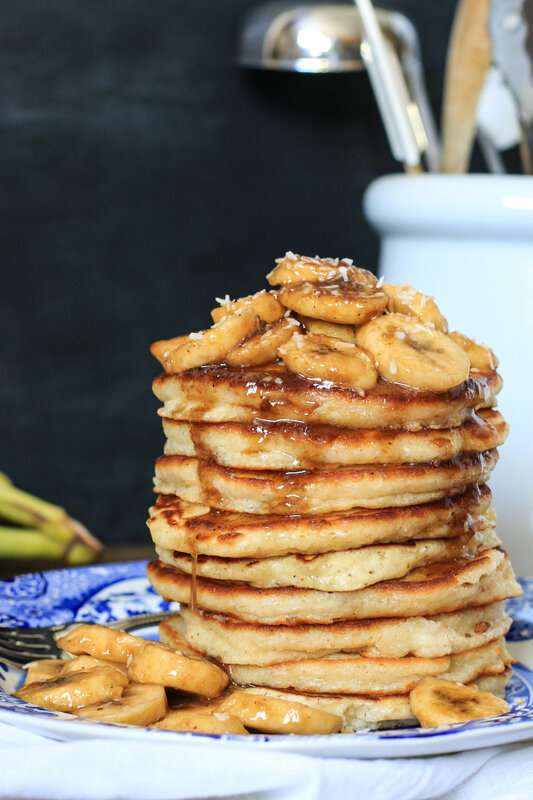 Assemble by stacking your desired amount of pancakes, topped with a spoonful of the bananas and then drizzled with the syrup from the bananas foster. Optional toppings include whipped cream, butter, syrup and more shredded coconut.